My taste in buildings has always been relatively young (40-90 years) from those of the International Style, the super cool Art Decos, the Modernists right down to the Bruts of the seventies. This day last week I returned to Ireland after a week in Rome, a city that surprisingly satisfied my architectural grá. 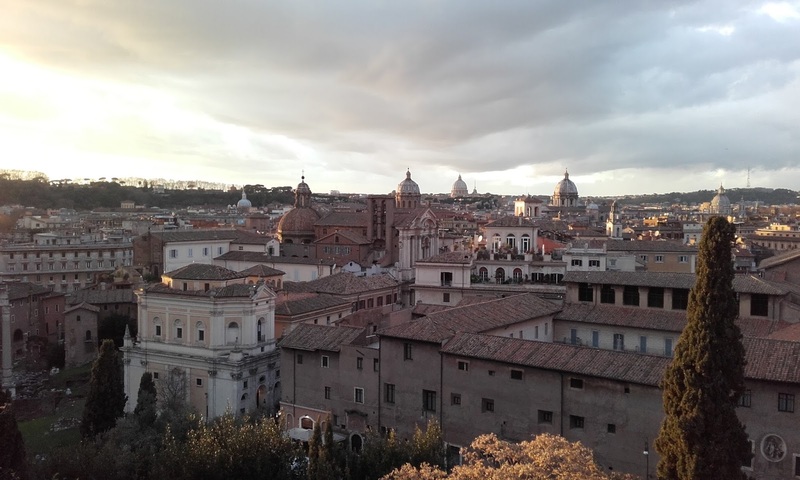 Rome is not frozen in time like Florence or Venice but nevertheless she is not a modern city. However she still retains her concrete expression of power, dominance and a vain attempt to return to ancient imperialism. 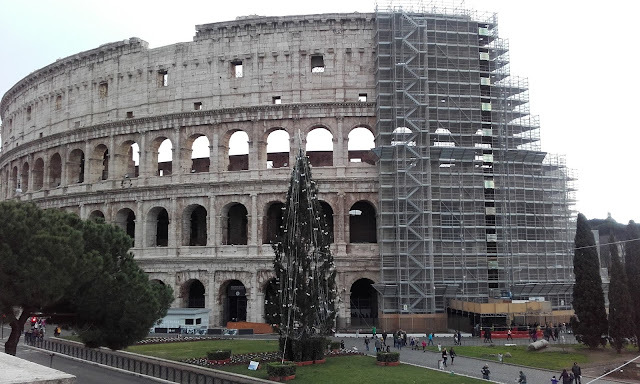 The physical manifestation of the ideology of Mussolini's fascism remains. Rome to me is a marriage of two dominant personalities; the commanding presence of the quiet, wise older centre who jostles beside his younger louder, feisty queen. Each side stands their ground equally in this unlikely union full of drama; the grace and stature of the older city tempering the brash, high-spirited youth. He has seen many a war; she was never tested. 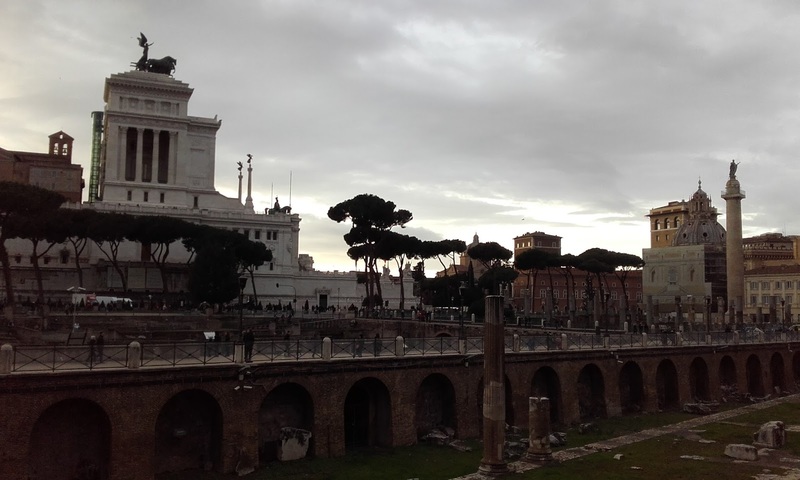 The pomp of the younger pale marble structures compliments the confidence of the raw, earthy, rusty colours of the rendered older city. In terms of its morphology the city's medieval core has had no previous partners as you'd expect such as Victorian, Edwardian, Art Nouveau, etc. 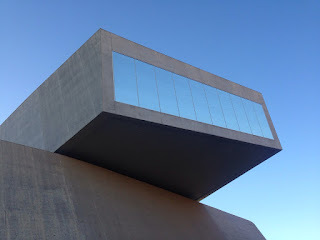 Rome does have contemporary buildings such as the MAXXI Museum by Zaha Hadid Architects and the new Congress Centre and hotel nicknamed 'the Cloud' by Fuksas Architects which is still under construction but already looks impressive. However the glory of the ancient and early twentieth century eras will never again be repeated. A recent friend I made in Dublin captivated me with the descriptions of his adoptive city of Rome. Having studied History of Art & Architecture and later Building Conservation in Irish universities the majority of our course material was centred around the principles of Classical architecture. The Georgians looked to what they perceived as the aesthetic truths of Vitruvius and Roman antiquity for inspiration. The symmetry and rhythm of Georgian architecture is what I grew up with near Limerick's Newtown Pery which made Dublin all the more familiar to me. In history of Art we learned about the Grand Tour that the landed gentry were expected to undertake in their youth taking in ancient ruins of Greece and Rome. Italy was a country that I had always planned on visiting but it was never in my top three. With the benefit of free accommodation I was presented with the opportunity to visit the city that was the originator of Irish architecture from the 18th century up to the present day with the odd trend of Georgian pastiche new builds. My plane landed in Fiumicino- Leonardo da Vinci International airport which is currently undergoing expansion. I could see the curve of the new roof from my seat like the beautiful contour of a woman's hip. 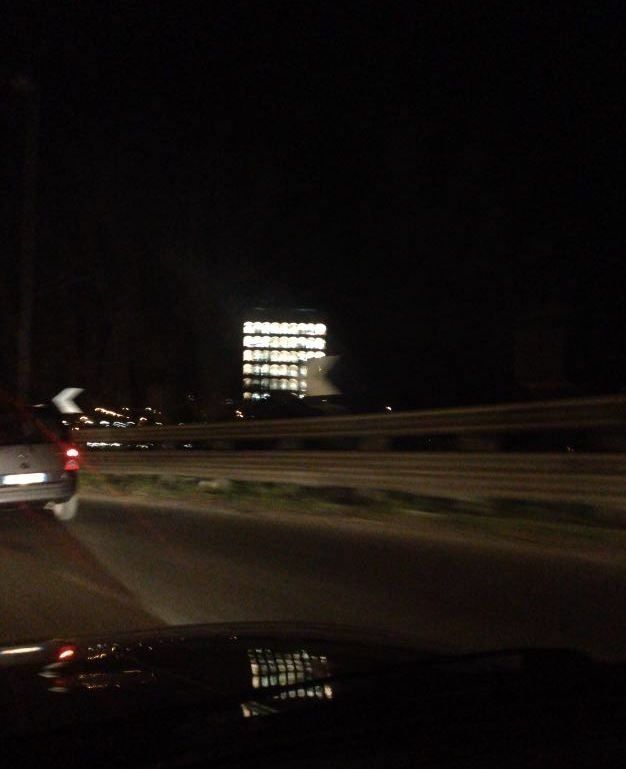 During the short drive from the airport to the city we passed the EUR district. I could see Mussolini's Palazzo della Civiltà Italiano near the motorway, his so-called Square Colosseum. This heightened my excitement for my trip immensely and what was in store for me in the days to come. I will discuss that wonderful building in my next post. 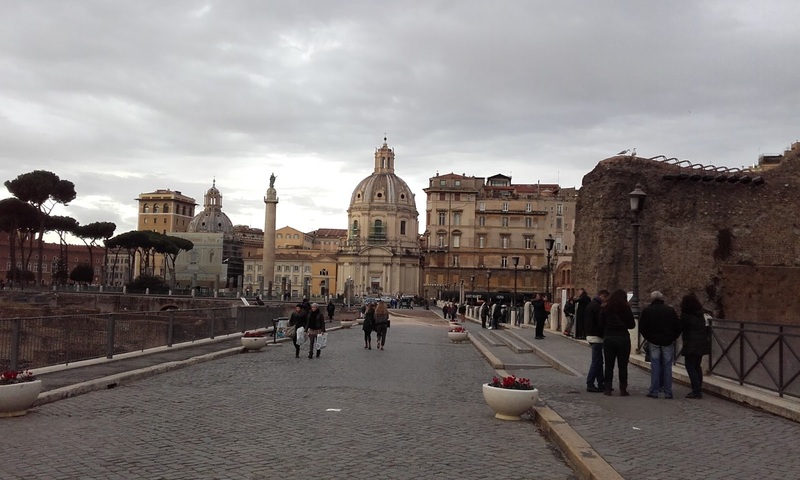 From there the car drove through an archway in the ancient city's walls and passed the Circus Maximus. It was as if we drove back in time. 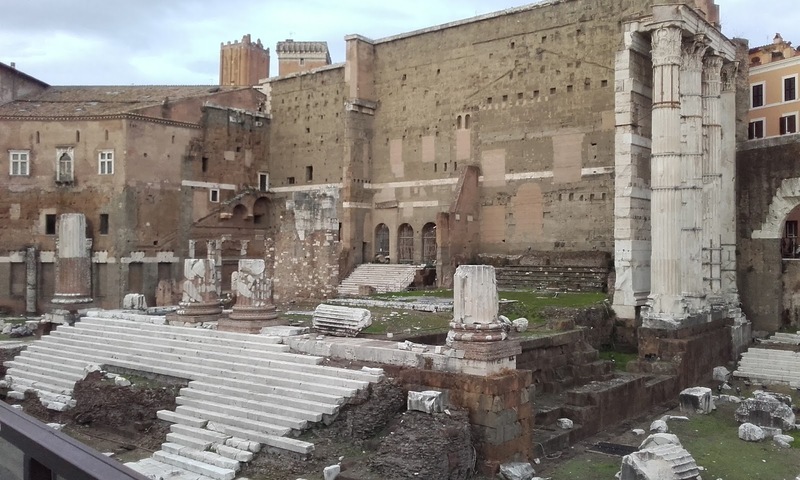 My first day (Wednesday) was spent walking around the centre near the Colosseum and the magnificent ruins of the Forum of Augustus. Halfway through the tour I was given a rooftop view of the city. The type of view the renders one speechless. What stroke me was each individual building was beautiful especially those who wore the passage of time without the touch up of paint or render. All the buildings in this ancient sea of bricks and mortar were of the same palette or russets, browns and some peach almost to the point of orange. 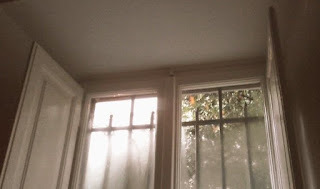 the January sun, I was greeted by the oranges on the tree outside. I was Eve in my Garden of Eden away from it all back home. My host's fruit ball was also full of the fruit. The food alone I could gush about. Bread that went stale the next day as it wasn't full of preservatives like Irish bread, the simplicity of the pasta and pizzas.....and the gelato. Everything there was just so relaxed. I think it's because everybody vents their rage through their cars! Even on the last day of my visit I still could not get my head around walking across the zebra-crossing with the green pedestrian light and still have all the cars and mopeds gunning for me. It is a small price to pay for the lifestyle. People live in the city centre over the shops and cafés. Villas converted to offices and apartments for single people, professional couples, families. All the laneways are full of life bursting with all kinds of shops including bookshops just for books printed in English. The trams and Metro system was very easy to navigate and a €1.50 gave you 100 minutes (from the time of first use) on all public transport. 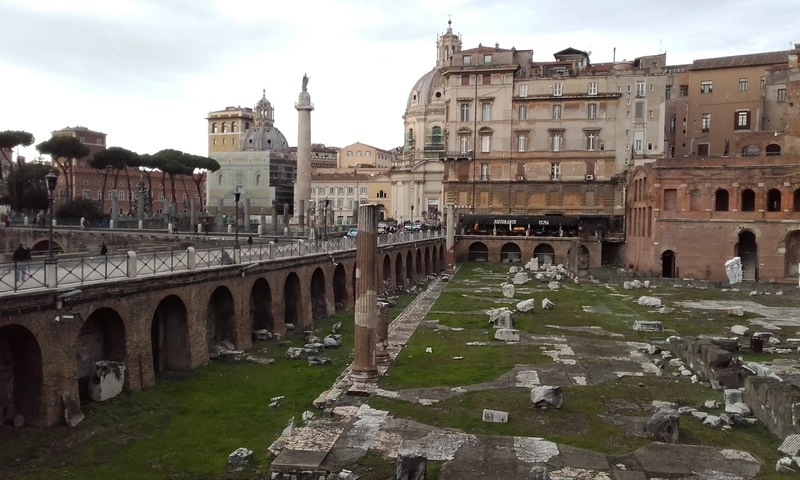 I will finish the post with the images taken on Day 1 of the Imperial Fora constructed between 46AD and 113AD. 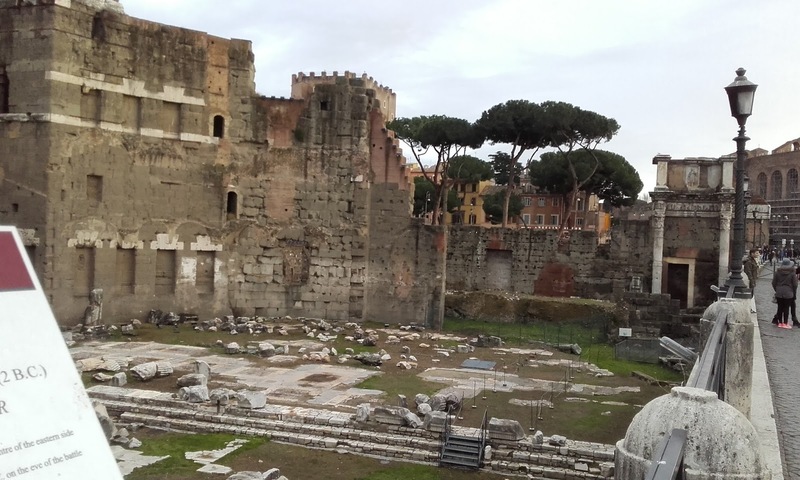 These forums were the very centre of the Roman Empire. 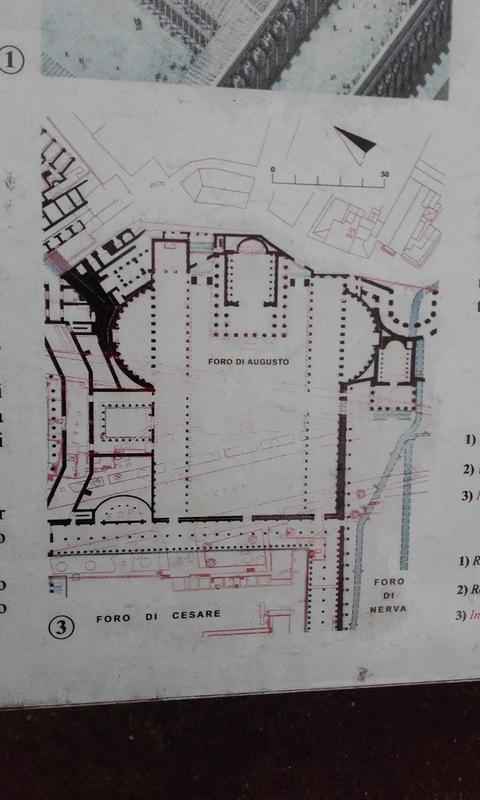 I have included a plan below that has Mussolini's new street he created in the 1920s outlined in red which destroyed part of these ruins. Buildings that we are all familiar with but were like a dream to me. Music everywhere and Italian sounded like poetry to my ear. Even the trees to me were sculptural and architectural. You will see that the roads run so close to these monuments. Some might tut but this is a living city and the traffic is the life force being pumped around it's urban arteries. I started falling for Rome the moment I clapped eyes on him with the bright blue skies and the rusty coloured rooftops. The unpredictability while always revealing something new. Never stopping. Familiarity and contradiction. It's inhabitants rushing in their cars as if in a Grand Prix but then stepping out to dine al fresco with a glass of wine stretching out that peaceful moment like magic. Truly living in it. Being in it. So relaxing and so intense at the same time. My eyes saturated with the visual splendor. Beauty that nearly brings you to tears. Tethering on the edge of bliss. The new street in red cut through the forum of Augustus and also rows of homes which naturally sprung up around in during the intervening centuries. 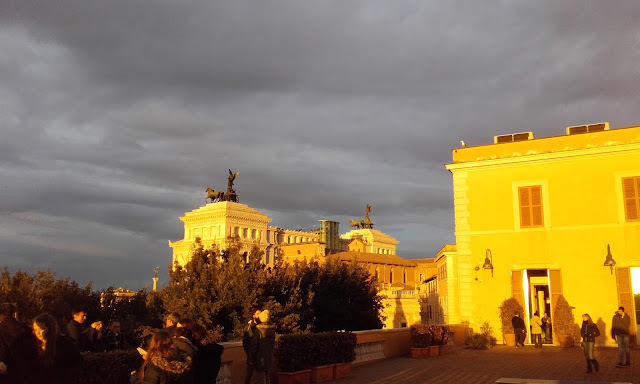 The Altare della Patria (the Altar of the Fatherland). This was the most visible landmark to me walking around the various parts of the city. 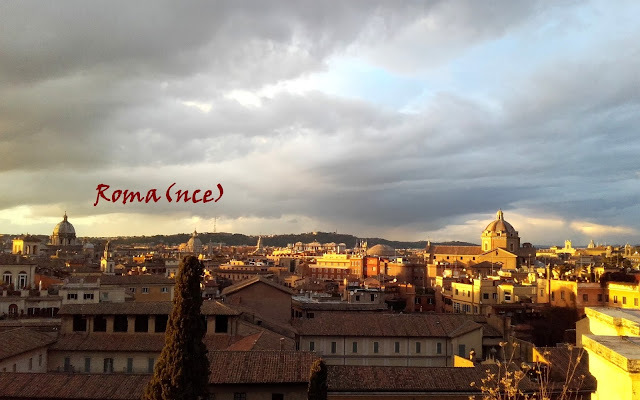 I have never visited Rome and with your lovely descriptions...I want to! !